So good student achievers and athletes, whose accomplishments and accolades set them apart, are perceived as aspiring to become “top dog” and therefore vulnerable. This affirms for me that the power of cyber communications emboldens many more to become the bully, and intimidates even more to remain silent or pile on while personal attacks escalate to murderous, hateful comments about a person’s physical appearance and character. 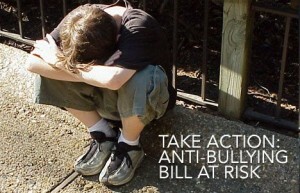 I believe the modern child experiences a bully climate in ways we cannot perceive unless we experience it at their age. The drama we experienced as adolescents without cyber connectivity is amplified for the modern teen; and it can easily take on a life of its own in the form of personal attack that sometimes convinces you that you cannot survive, or worse yet, that there is no point in surviving it. Did you have an arch nemesis in middle or high school? What would she have done with an Instagram or Twitter account? After a decade of prayer, fieldwork, research and writing about the impact of the network culture on kids and families, I have concluded that our cyber-powered children can land on a deserted island in the realm of hearts and minds, wherein a “’Lord of the Flies’ group think” prevails in plain sight. Unchecked, youth can become completely isolated from their relationship with God and family. Compounding the isolating power of texting and social media, the standard of civility that previous generations experienced as “norms” is obscured when cyber-powered peer communities become the point of reference for life. It is up to parents and educators to take a proactive role and advocate for a peaceful society when drama becomes a cyber-powered attack. Be clear about the difference between conflict and bullying. Conflict happens when there is dissention or disagreement among equals; bullying happens when there is perceived difference in power (i.e., one party is perceived as physically or emotionally vulnerable or of lower social standing) and that power differential is leveraged to attack. Document the harassment (capture screen shots and text dumps), and make sure your child does not respond to the attacks. Take action to shield. If you have concern for your child’s safety, you may need to relocate your child, and/or cancel the phone/social media accounts. You may need to cancel your child’s mobile phone number and close social media accounts. Report hate speech via texting or social media to the FBI. New Tools.“Seth’s Law” is a new law that strengthens existing state anti-bullying laws to help protect all California public school students. Seth’s Law requires public schools in California to update their anti-bullying policies and programs, and it focuses on protecting students who are bullied based on their actual or perceived sexual orientation and gender identity/gender expression, as well as race, ethnicity, nationality, gender, disability, and religion. Know the law. There are federal laws that protect your child’s civil rights on school campuses. Do not allow others to minimize abuse as acceptable or a phase. Your child needs to understand the importance of standing your ground with confidence in the face of an abuser. For more about the laws protecting the civil rights of a child being harassed and cyber-attacked, contact: BRAVE Society. Contact The Victims of Crime Resource Center. Posted in Bullying, Children's mental health, Cyberbullying, Faith, Family, Internet Safety, Internet Social Networks, Mobile Phone Use and Children, Parental Authority, Parental control, Parenting, Peer abuse, Social Media, Teenagers, The Fish 103.9FM Cyber Tues, Youth Suicide, Youth violence.